Coloring drawings or colouring pictures. The thumbnails are gif-format and the large pictures are jpg format, but you can download them as Corel Draw (.cdr), because so the quality is best for printing. They are all ca 18 x 27cm(A4). YAMAHA designed two wonderful papercrafts of penguins. 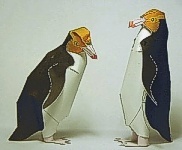 They made sculptures of african and yellow-eyed penguins. The models are about 8 cm tall. As you can see on the pictures, it is quite possible to make them, if you're a bit handy. But follow their instructions carefully about paper and glue, because first I tried another glue and that didn't work good. I used paper of 160g/m² and wood glue. I changed and enlarged this model a bit: about 17 cm tall. 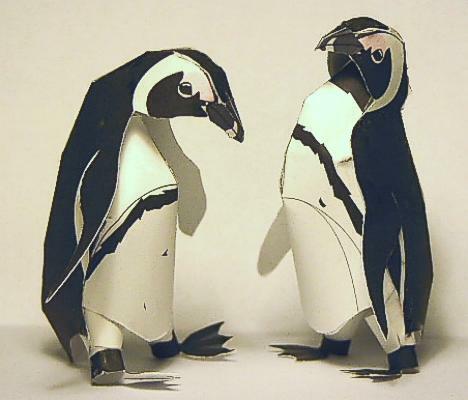 Canon too has a similar papercraft: it is a model of an emperor penguin. Baby seat in penguin shape. 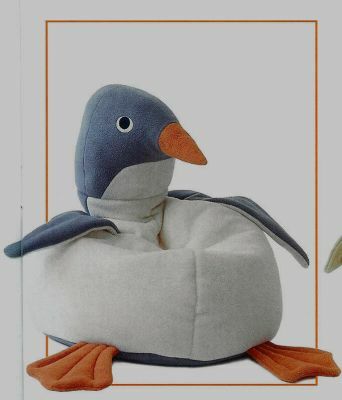 In the Dutch magazine Knippie Baby winter 2002/2003, you find a pattern to make a baby seat in penguin form. With thanks to Hannie van Grinsven who mailed me the picture and tip. Links to crafts with or about penguins. A few links to sites where you can find handicrafts with penguins. Penguin, made with a plastic bottle and paper mache : ment for children between 4 and 7 years old, in German. African penguin : coloring picture. 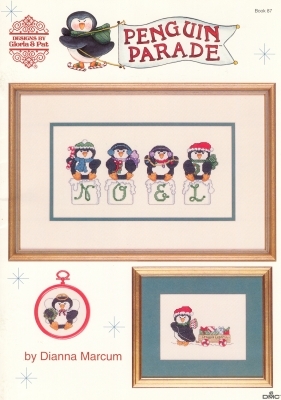 Embroider : there exist a special book with penguin models to embroid. It's a special edition from DMC, edited in the USA in 1993.